1) The big news from this past weekend is that Calavera (2337 Broadway) — the upscale Mexican restaurant that is the latest, and perhaps most ambitious, project from the Oakland restaurateur Chris Pastena (Chop Bar, Lungomare) — is now open for dinner in Uptown Oakland’s Hive complex, as first reported by Inside Scoop. 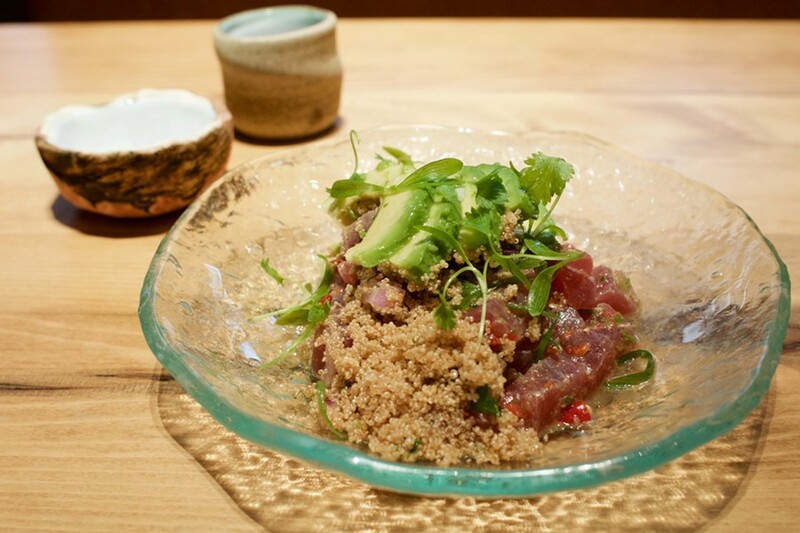 You can check out chef Christian Irabien’s menu here, with Oaxacan chapulines (aka fried grasshoppers) as the most striking appetizer option, scratch-made corn tortillas, and entrées that range from chili-chocolate braised birria to whole grilled red snapper. Meanwhile, I expect boozehounds will geek out over the selection of rare mezcals and Mexican wines. 2) Also new at The Hive, Drake’s Dealership (2325 Broadway), a massive brewpub/beer garden/wood-fired pizza spot, opened for business this week. In addition to a menu of pizza and upscale pub fare, the 32-tap beer selection will include the full Drake’s Brewing lineup, including some hard-to-find, limited edition brews. Eater has a bunch of pretty pictures of the space. Gaylord (left) and Vlastnik on the truck. 3) In the Express’s Summer Guide edition back in May, we profiled the Oakland-based tea company Steep Tea Co, whose most exciting initiative was a forthcoming “Steep Jeep” — like an old-fashioned ice cream truck, except they’d be hawking iced tea instead of Good Humor bars. 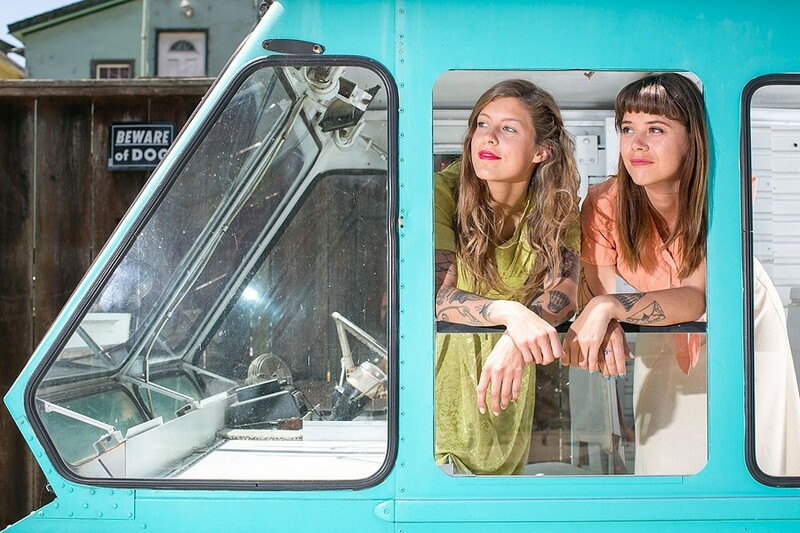 Now, it looks like that dream is coming closer to reality, as proprietors Karina Vlastnik and Molly Gaylord are getting ready to launch a Kickstarter next week to fund the project. I’ll post a link when the campaign goes live, but in the meantime Steep Tea Co is doing a popup launch event at Woods Bar & Brewery (1701 Telegraph Ave., Oakland) at 6 p.m. on Monday, August 17. Woods Bar is already known for its tea-infused brews, and Vlastnik and Gaylord will add their tea drinks to the mix. 4) Some news from a recent walk through Chinatown: Tian Jin Dumplings (989 Franklin St.) had a sign up saying they’re on vacation and won’t reopen until September 12, and popular banh mi joint BC Deli (818 Franklin St.) is closed through at least the end of August for a remodel and an earthquake retrofit. Meanwhile, it appears, sadly, that Chef Lau (301 8th St.) — one of my favorite old-school Cantonese spots — may be closed for good. 5) Over in Alameda, Feel Good Kitchen (3215 Encinal Ave.), the breakfast-and-lunch-spot offshoot of the popular Feel Good Bakery, closed at the end of July. 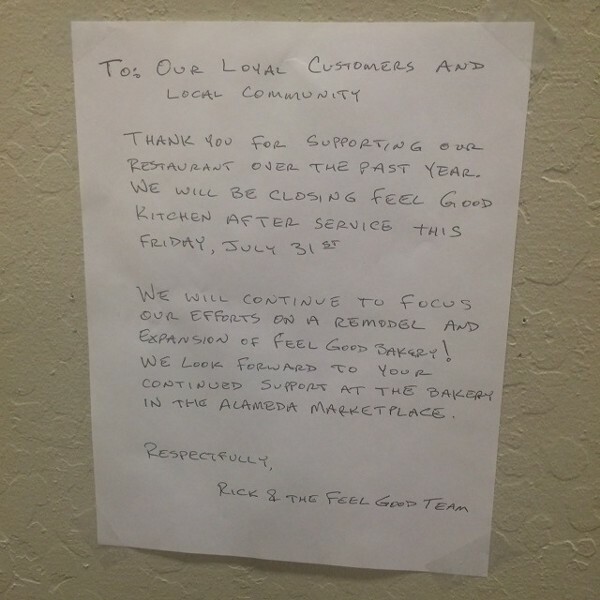 According to a note posted at the bakery’s Alameda Marketplace location, Feel Good plans to concentrate on remodeling and expanding the bakery itself. 6) Last month, we brought you the news that Berkeley’s Pyramid Alehouse had shut down suddenly, and there were rumors that another brewery might take its place. Now Berkeleyside Nosh has an update: It looks as though Retail West, the developer behind the nearby Gilman district project, plans to turn the building into a commercial kitchen that would include among its tenants a number of smaller breweries and distilleries. Needless to say, there’s an extensive permitting process associated with a large-scale project like this, so construction isn’t expected to begin until the end of the year. 7) It has been a week of high-profile openings: In addition to the ones listed above, The Advocate (2365 Ashby Ave.), the long-awaited restaurant from the folks behind Comal, is now open in Berkeley’s Elmwood neighborhood. This time, instead of upscale Mexican food, the menu has more of a Mediterranean slant, with the flavors of North Africa especially prominent. 8) Eater reports that Ramen Shop (5812 College Ave., Oakland) has completed its expansion into the former luggage store next store. That means more seating for the always-crowded noodle shop, plus an expanded bar bites and cocktail selection, with lunch service and maybe even takeout on the way. 9) Also in Rockridge, recently-reviewed vegan fine-dining restaurant Millennium (5912 College Ave.) open for Sunday brunch, 10:30 a.m.–2 p.m., starting this week, Tablehopper reports. There’s no menu posted yet, so we’ll leave it to you to imagine what eggless morning delights chef Eric Tucker might have in the works. 10) Finally, in case you missed it, Oakland is becoming a hub for Taiwanese fried chicken. Don’t miss Bert Johnson’s video about the “G-Pie” at Chick & Tea; it’s guaranteed to make you hungry.